Why Choose Hockey Opportunity Camp? HOC is an excellent choice for parents looking for a traditional summer camp experience in beautiful Northern Ontario, with “best in class” hockey training and a variety of exciting activities for their children to enjoy. We make summer camp easy for your campers... and you. Each camp session is a minimum of one week long, making it an affordable and safe option for campers who have never attended camp before. All campers are dropped off at camp on Sunday, giving parents an opportunity to see, first hand, where their child(ren) will be spending the week. 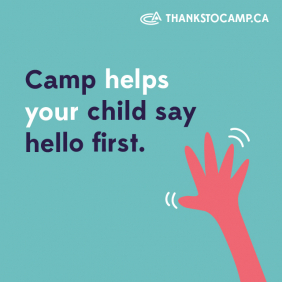 Parents also have the opportunity to meet the many staff members that will be a part of their child’s week at camp including, directors, health care staff, counselors, activity and hockey instructors. For parents of hockey campers, when they pick-up their child(ren) on Saturday, they have an opportunity to see their camper play a hockey scrimmage game. (Ranger and Senior scrimmages take place Friday night). Campers are grouped age appropriately. Your child will be in a cabin with a total of 8-10 campers. We try and ensure that campers bunking together are all within one grade level of each other. Meals are family style... campers can eat as much food as they want! We provide family style, all you can eat meals prepared with highly nutritious fresh food. GB Catering, our hired catering company, can accommodate many different kinds of food allergies. We would be happy to discuss your campers allergy in more detail and discuss the exact menu that will be served the week your child will be at camp. Our Tuck Shop & Kitchen also do not stock any products that contain visible nuts or nut products. Our staff is the very best. Your child will be supervised at all times by our caring and well-trained staff. Our counsellors sleep in a separate room within the cabin with the campers. Various staff members can be used as resources for your camper while at camp, giving them the confidence to address questions or concerns immediately. This camp is perfect for both girls & boys who play organized hockey – or not! – and want a traditional summer camp experience. All Camp Programs: 7-15 yrs of age. We are 100% focussed on health & safety. We take care of all the equipment & gear. Hockey Opportunity Camp supplies all the required equipment for each camp activities, including bikes and helmets. Hockey campers are required to bring all their own personal hockey gear. After registering your child you will receive a detailed checklists of everything your child will need to bring camp. Click the link to view your camper's program-specific HOC Handbook for more specific camp details. We make it easy to stay in touch with your campers. But... the best reasons to choose HOC come from parents of past campers. Here are a few comments from our parents. To read more, click here. He LOVED the food – always enough – loved the hot chocolate in the morning. Favourite was the cookout! I just want to take this opportunity to thank you and your staff for providing my son with an amazing experience. Cody had the time of his life last week, and with that we will be returning next year for another exciting summer. He enjoyed the interaction. They were very nice he said. Very patient with a homesick boy.